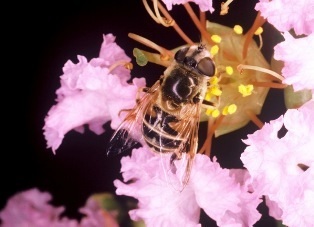 The hover fly is one of the many great beneficial insects found in organic gardens. Most insects are beneficial. Even some of the troublesome insects like aphids perform beneficial services like telling us that the plants are in stress. The goal is to establish a natural balance. There are four beneficial insects and one other beneficial organism that I want you to buy and release starting now in the early spring - trichogramma wasps, green lacewings, lady beetles or ladybugs, and beneficial nematodes. Trichogramma wasps are tiny gnat-like wasps that are very effective in controlling pecan casebearers, loopers, greenworms, and other small caterpillars. They are parasites, not predators. They are released by simply pinning or tying the one inch square cards or strips to trees or on wood stakes in the garden. Green lacewings are pretty little flies with large wings. Their larvae love to eat aphids, red spider mites, lacebugs and many other pest insects. They also help control thrips in roses, gladiolas and many other flowers. Adult ladybugs are released directly on aphid infested plants after giving the plants a spray of water from the garden hose or in the morning when the dew is on the foliage. Nematodes control ticks, fleas, termites, chiggers, fire ants and many other pests. Apply beneficial nematodes anytime pest control is needed. Treat active fire ant mounds with dry molasses or drench with a mixture of orange oil, molasses and compost tea. These beneficial insects along with more detailed release information are available at ARBICO Organics.